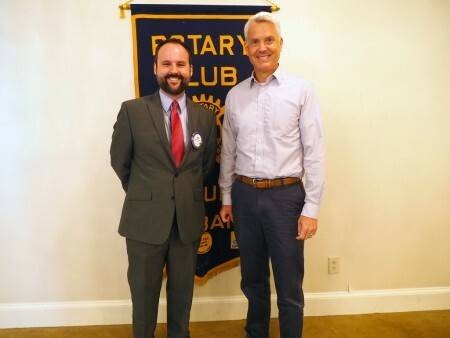 On July 26, the Rotary Club of Auburn Alabama hosted Jeff Shearer (right), who shared his perspectives of covering sports for more than 30 years -- first as a television sportscaster, including serving as sports director for WSFA in Montgomery, and now as the senior writer for Auburn Tigers and AuburnTigers.com. Pictured with Shearer is Club President Chris Warren. The club meets each Wednesday at noon at the Saugahatchee Country Club. For more information about the Auburn Rotary Club or how to become a member, visit www.auburnrotaryclub.com.